For the second day of our MTB tour (day one here) we were heading out from Montecatini into the Marsh Land of Fucecchio or the Padule di Fucecchio, known since ancient times as “an insalubrious and dangerous area”. These days the Fucecchio Marshes cover an area of about 1,800 hectares, however these ancient lake-marshes were considerably larger in the past and once covered most of the southern Valdinievole. In 217 BC, Hannibal took four days and three nights to cross these marshes, loosing along the way most of his elephants (well the ones that had survived crossing the Alps), a large chunk of his army and an eye (due to an infection). Or at least that is the story Livy tells us in his History of Rome. By the Middle Ages there was increasing interest in draining the marshes, with the great Leonardo da Vinci studying their hydrology and the Medici and Lorena families putting up the money and then taking the profits from the system of grand-ducal farms which were created. However, even after all the changes over the last few centuries, the charm of these wetlands remains intact today. The traditional way to get about the Padule was by barchino (a form of punt) or navicello (a flat-bottomed sailboat). These days, as a result of the drainage, the marshes are criss-crossed with strade bianche (gravel roads), and so the mountain bikes make an ideal way to see some of the area in a shorter time than it took Hannibal. Our day started by threading our way out of Montecatini Terme (where we were staying at the Hotel Arnolfo) through the rush hour traffic. Once again I was surprised by the patience and tolerance of Italian drivers, only once on a roundabout did we get tooted at by a driver who also made a rude gesture which I had only previously seen on TV Inspector Montalbano on BBC 4. Leaving the town behind, we were guided along the bank of a canalised river, which I had expected to lead us into the Padule proper, but to my surprise we then turned back on to the road again. Taking a right turn into what at first looked like a side road, there was a barrier to keep out motor vehicles and a ribbon of super-smooth tarmac appeared beyond. Once we rode onto it, we realised that this was a bike racing circuit. Riding round, our mountain bikes felt a little like riding Hannibal’s elephants especially when overtaken by a light cavalry charge of kids from a local cycling club on road bikes. Realising that I am getting too old to lead the chase, I sat up and decided to ride the rest of the circuit hands free, which was great fun, especial on the hairpin bends. Play time over, it was back to the strade bianche and exploring the marshes, which are rich with wild life. Today the Padule are a strange mix of reed beds, maize and tobacco crops, and plantations of poplar and alder trees. Our local bike guide, Massimo, told us how during the winter these plantations would flood and how he liked to to kayaking between the trees. The area is popular with both bird watchers and hunters, it is not uncommon to see spent shotgun cartilages lining the side of the tracks. Of the 1,800 hectares of the Padule di Fucecchio only about 230 hectares are protected nature reserve, and the first people we were to meet were a couple of hunters and a wildlife photographer at Casin del Lillo. The hunters were very hospitable and had set up a gazebo with a table of refreshments for us. Well it was the right time for a mid morning snack, and just the three bottles of wine. Casin del Lillo is one of the many “ports” of the Padule, where the hunters set out on their barchino to stalk game, or just take tourists on sightseeing trips. We were taken out in groups of four for a short taster ride in a barchino, while the others tasted the local specialities which had been laid on for us. Seeing the drainage canals close up, you really get an idea of the level of eutrophication from the local agriculture. This isn’t the only environmental problem the Padule suffer from. There are also invasive species such as the red swamp crayfish (Procambarus clarkii) which are undermining the dykes which contain the drainage ditches. Now you might think that the solution to the crayfish problem would be to trap and eat them, but this would be ill advised as the crayfish are subject to heavy uptake of lead from the lead shot used by the hunters. Not that we let any of this spoil out visit, of course. The next stop on our itinerary was a nature reserve, established by the Provincial Administration of Pistoia (207 hectares) and Florence (25 hectares). The area we were to visit is the oldest protected area in the marshes, which is managed by the Centro di Ricerca, Documentazione e Promozione del Padule di Fucecchio (the Centre for Research, Documentation and Promotion of the Fucecchio Marshes). Along the way I had been hearing the calls of a bird of prey which I hadn’t manage to spot and wasn’t sure what it was. So I was pleased when our guide from the research centre pointed to a couple of birds zooming overhead and told us that they were a family of Lodolaio with the adults teaching the young how to hunt. There was just one problem, what were Lodolaio? He dug out his field guide to show us a picture and gave us the scientific name Falco subbuteo, now at one time this would have meant people looking at the picture to find out what they were, but not now. There was a flurry of phones pulled from pockets, a quick Google search, and we knew that they were called Lodolaio in Italian, Hobby in English, Baumfalke in German, and Boomvalk in Flemish. We were then taken to a bird watchign hide overlooking part of the restored marsh. There were a wide range of water fowl to be seen, but the highlight for all of us was a Spoonbill (Platalea leucorodia, or Spatola, Löffler, or Lepelaar, as you please). I was cursing not having brought my camera with the big lens, having left in the car with the film crew who had been following us around. Then I noticed that Ulli was trying to take a photo through the eye piece of the spotting scope which our guide had brought, so I decided to try the same with my phone camera. The (cropped) image below is the result of a OnePlus 3T phone camera taken via a Swarovski lens, which I am rather pleased with. The nature break over, we headed off for lunch, according to the itinerary this was to be a light lunch. At one point I stopped to take a photo, as nothing quite says “cycle touring in Tuscany” as well as a picture of a far off hilltop village and the sight of your companions dispersing into the distance at the prospect of a “light lunch”. The chosen place for lunch was the Grotta Giusti Spa, and let’s just say the food was not the highlight of this stop. The highlight of our visit was the thermal caves, apparently the largest in Europe, where you can “enjoy the detoxifying steam”. These caves have had an illustrious stream of visitor over the years: Giuseppe Verdi called them the eighth wonder of the world, Garibaldi came and had his photo taken. However, sadly, there is no record of Hannibal (or his elephants) ever having visited. 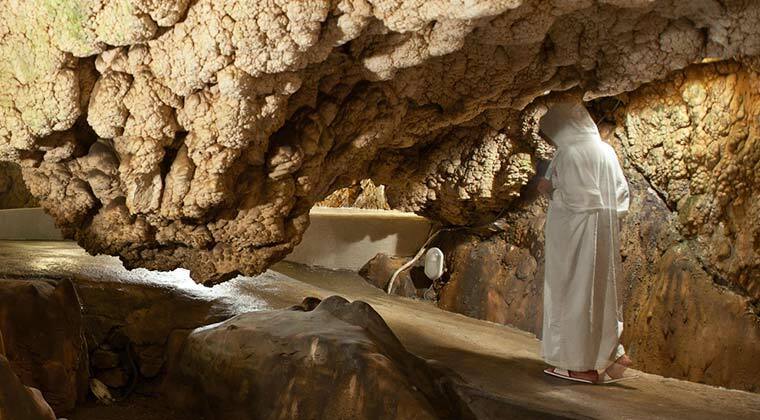 The caves are divided into three distinct areas called Heaven, Purgatory and Hell. The other curiosity of these caves is that the stalactites have a strangely cauliflorous appearance with bobbles all over their surfaces. Before entering the caves you have to put on special robes, which make the wearers look rather like Benedictine monks as they shuffle into the caves. When reaching the area known as Purgatory, the path divides into two, with most people turning left and going straight to Hell. It turns out that Hell is a broad low ceilinged cavern with people sitting around in deckchairs, in 36°C heat with near 100% humidity. No wailing and gnashing of teeth here, just signs saying “Il silenzio aiuta il relax, Silence helps relaxation”. On leaving Hell, after a restful doze, I decided to pass through Purgatory and visit Heaven, which turned out to be a smaller cavern with a small pool of water. The temperature in this section is a constant 28°C, which did feel blissfully cool after a period in Hell, although the place was strangely empty. It was not somewhere people seemed to linger, unlike Inferno. After leaving the caves and returning to the surface, we spent some time hanging out at the spa’s outdoor swimming pool before heading off on the bikes once more. The final stop on our itinerary was the Terme Tettuccio spa at the heart of Montecatini town. Getting there did require riding through the heavily congested traffic, which makes me wonder why they don’t put in some proper cycle infrastructure and reduce the level of congestion? After all if places like Ferrara and Bolzano can do it, why not in towns in Tuscany? Hey, even Milan manages better than this. Thankfully, as I have said before, Italians seem to be very tolerant of cyclists and we did finally make it to the Terme Tettuccio, a place which in many ways defines the town. The thermal springs were a site for votive offerings in Roman time, although the Romans were noted for making such offerings at water courses generally. The first written evidence of the use of thermal baths dates back to 1201 AD when a merchant from Prato, Francesco Datini, wrote to his doctor to ask about the waters. However, the spa really took off around 1400 AD when another doctor, Ugolino Simoni da Montecatini, wrote a treatise on the therapeutic use of the waters by the local peasants. The spa as we know it today is as a result of work started by Grand Duke Pietro Leopoldo of Lorena, who initiated the construction of the Bagno Regio (1773), Leopoldine Baths (1779) and Tattoo (1779), which form the core of the modern Spa town. The current Art Nouveau buildings date from 1928 when water from four thermal springs were all piped into one place for the serious purpose of parting the rich worried well from their money. The four springs that feed the spa are given different names: Leopoldina, Regina, Tettuccio and Refreshment. Each contains a range of mineral salts which give them a characteristic salty flavour, all the waters are diuretic, but have no fear of being caught short: there are 1000 toilets arranged over two floors, ground floor for the Ladies and first floor for the Gentlemen. I kid you not! However, to give Terme Tettuccio its due, the place is stunning, the floors, the walls, the ceilings, just art everywhere. But where’s the cycling angle? I hear you ask. Well, apparently the great Eddy Merckx tried the waters here, before winning the Giro d’Italia five times. I think that is good enough. "E-mail is not to be used to pass on information or data. It should be used only for company business."